On January 29 and 30, IDEA seniors gathered at the National 4H Center in Chevy Chase, Maryland, to envision their futures. Members of the Class of 2019 had the opportunity to take a break from the everyday routine of school to think about their futures, with a little help from each other and some motivational experts. The keynote speaker for the retreat was Roderick Mitchell, owner of Success by Fire, who spoke with seniors about finishing their high school career "strong, strong, and stronger." Small group sessions focused on topics such as intrinsic motivation, key tools for creating your big picture, and true grit. Facilitators and speakers included David Gaston, Ivan Taylor, Chelita Dyson, Paris Simmons, and IDEA's own clinical counselor Yvette Brown. 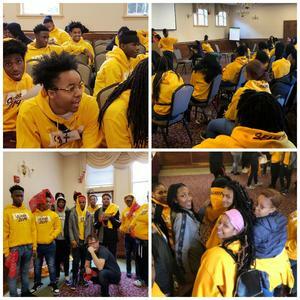 "Scholars created new bonds and enjoyed fellowship with each other," said senior class advisor Shana Wilson. "This was a great bonding experience as our seniors move toward our finish line in June." Several IDEA staff members, including Autumn Gabriel, Alexandrea Rich, Bill Stevens, Udean Mars Williams, Peter Camacho, Regina Jewett-Crudup, Lori Briscoe, and Shomari Jennings provided additional leadership and support for the retreat. Ms. Wilson and Marco Brooks, also a senior class advisor, planned the retreat. "I can truly say our seniors were happy and I believe light bulbs are starting to go off about what's ahead in the next chapters in their lives," said Principal Nicole McCrae.